Here's a very minimal Debian Jessie image for the ODROID U2/U3 series. Most of the packages available in my repository are X11 based, for example the mali400-odroid package are X11 GPU drivers, or Kodi, is only available for X11, so you need a Desktop environment to use them. If you find any bugs please let me know, and if anyone else wants to, I can easily convert this image for ODROID X,X2. Last edited by meveric on Tue Aug 23, 2016 12:41 am, edited 6 times in total. I installed in the night from Friday to Saturday this image. Except for 'libcec' all Installitionen made. Great. Works directly !! I am using this distro, so far so good. I have problems with apple making airplay useless on non apple devices at the moment, and i am finding a new way to stream spotify music to my odroid. I don't have error like other people in the post, SCplayer starts and i can see the web interface, i can control it from my mobile so all good. BUT, no sound coming out from nowhere. but im not a java guru and dont really understand it. and only jack in supports PCM whatever it means. on forums i read that raspi2 users need to execute this command: "echo snd_bcm2835 >> /storage/.config/modules-load.d/audio.conf" to enable sound in command line. do we need to do the same? if then how? it was 2 am so i went to bed after, i havent tried it with not root user, and neither from gui. 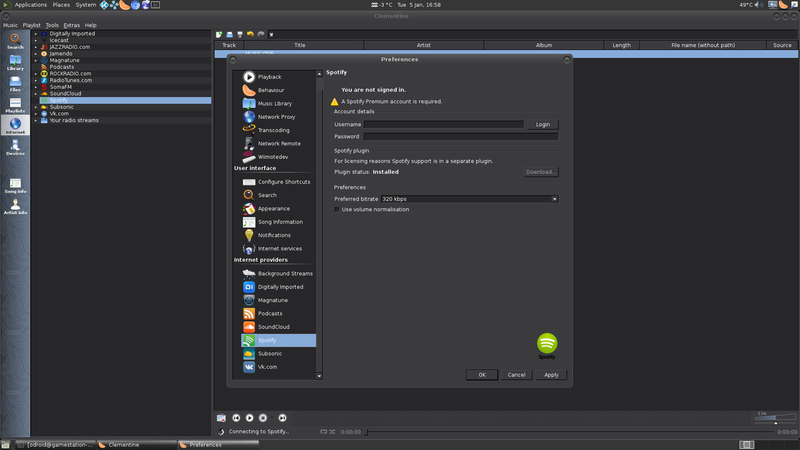 if someone finds a solution it can be a way to listen spotify on odroid. And thank you very much for this, you gave life to my odoid after 2 years aswell! As you can see in the pictures it has spotify support as well, but I'm not sure if it's working, since I don't have an account there. What is the default password for root. When you ssh to the U3 , odroid as a password is not accepted. by default SSH login for root is disabled. That's default for Debian Jessie. You will find a line: "PermitRootLogin without-password"
comment out that line and restart ssh and you can login as root using ssh. meveric wrote: by default SSH login for root is disabled. You should add that to the OP. Nice image, works great. Using it as my tvheadend backend and for general compiling. Works like a charm. Great work! If I can make one suggestion for future images - please include wireless-tools in the base image, not all of us have console access near an ethernet port. I'm going to use this base image to build a pkgsrc-based system as I'm more used to NetBSD than Linux. Are you sure it's not working? I just checked on the C1 and Wifi Module 4 was working out of the Box. Should be the same on the U3. What Wifi Module are you using? It's recognised as an interface, but the iw* tools are not there and using /etc/network/interfaces, I see the wifi device blinking twice then going off - it never gets associated with the network. Once I've installed wireless-tools and one of the sets in tasksel (MATE I think), it started working as expected on boot, before getting to lightdm. Yes it's a little hard to configure WLAN just using /etc/network/interfaces if you're not used to it. i'm conscious that SSH login for root is disabled by default. my question is: Is there any other regular user/pass that i can use to access the server via SSH for the first time after which i can allow root login or just "su -". Thanks meveric for your swift response. please can you let me know how to access the server for the first time? i tried to edit the sshd_config on Windows before uploading the image to my u3 device, but i couldn't make a .img file back after extracting it. Over HDMI with a keyboard, you will need to logon to the server physically and edit the file or do it on a Linux machine. Is it possible to get algif_skcipher module loaded? uploading new Kernel right now it should be available in a few minutes.. let me know if something else is missing. modprobe: FATAL: Module algif_skcipher not found. ok, did some testing, I had a typo for the module, I rebuild the Kernel and uploaded a new version. I did some testing with it and both cryptsetup benchmark as well as creating luks partitions are working now. thank you for getting a U3 Debian version out similar to your XU4 image. a quick forum search i came across a walk through to compile TP-LINK T4U ( RTL8812AU) drivers. just wondering if your planning on adding support for the new ac wireless adapters similar to the XU4 image. No plans, are you sure the drivers are not yet included? Most of these things were included into the Kernel at some point. Besides that, since you have the headers installed for the Kernel, you can probably just create a module for it following the guide. Which did create the module. I just never got the card to be recognized. On the xu4 I had no problems as you already had it included. I wasn't upset as the internet connection at my house really doesn't need wireless AC speeds. I do see that most of the wireless AC USB adapters are using the RTL8812AU chipset. I might go back through and see if I can figure out what I missed later next weekend. Thank you for getting us a Debian Jessie image to run on the U3. Is it possible to get a correct picture on a monitor with 1920x1200 @ 60Hz via DVI-IN? Well, my question is more about an "how" than about an "if". Nice image - once more Thank you! The U3 doesn't support 1920x1200 resolution as far as I know. Thanks for the image. It works, so far so good. I'm from Germany and would now like to change the appearance on German. Switching the keyboard to German, as described above, unfortunately, had no effect. If I, for example, try language-selector-gnome to install with apt-get I get a message that does not exist the package. On my XU4 that was no problem. I am now very confused and hope for your help. StallionP51 wrote: I'm from Germany and would now like to change the appearance on German. I tried it many times and it always worked. Make sure you use the right program. There's one program that is just for the terminal and another program that is for desktop. If you install a Desktop I advice using MATE, it will ask for keyboard layout during install and will always work. If you use it for terminal only you need to install console-setup and use it, will work. In both cases make sure you reboot the system afterwards. StallionP51 wrote: If I, for example, try language-selector-gnome to install with apt-get I get a message that does not exist the package. 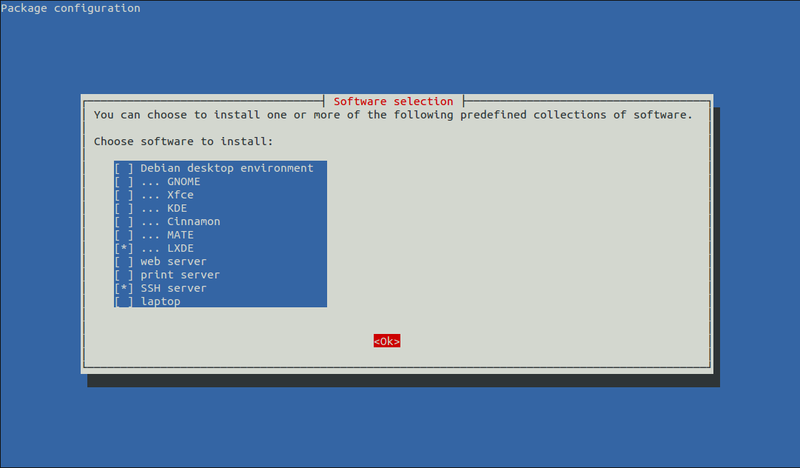 language-selector-gnome only exists on Ubuntu, not on Debian, that's why there are other packages. There's also a graphical tool for selecting the language if you install MATE Desktop. Vielen Dank für das Angebot, komme gerne darauf zurück. Ich bin schon etwas älter und komme noch aus der Zeit von Rope-Memory. Mein Englisch ist auch ziemlich eingerostet. Aber, damit jeder was davon hat, die Antwort auf Englisch. Thank's for your advice. "Dpkg-reconfigure locales" has solved the problem. The desktop now appears in German. Under System -> Settings -> Keyboard the German Layout was choosen but without functionality. (I don't why) Reloading of the German Keyboard layout brought success. I think it's a good idea to study dpkg and his posibillyties. It's a wonderfull tool. I'm a newbie in Debian and Linux and try as best as I can to learn the stuff. Such tips are very usefull to understand the differences between debian and ubuntu. Of course, such excellent tutorials too. Do you have a PGP signature for it please? PGP signature for what exactly? I meant, do you have a PGP signature for the file Debian-Jessie-1.0~RC2-20151205-U.img.xz which I can use to verify the integrity of the file I downloaded, before I put it to use? so that would be the obvious one to use. That's good, thank you, the MD5 sums match. However, it's been shown (e.g. http://www.mathstat.dal.ca/~selinger/md5collision/) that it's possible to create different files with the same MD5sums, so it would be really, really nice if you could sign the file with a key that was well-integrate with the web of trust. not sure if any of my keys is "well-integrated in the web of trust"
I have a couple of keys, but besides here or for work I don't use them. I can sign it with my key that I use to sign my packages, but that's about it. Just fired up my odroidu2 and got everything working for the most part. For the desktop i'm using ldxe. Even with the drivers installed there is still some expected window lag right? Like it takes a few seconds for the window to re-draw? I probably should also update my sd card to a class 10 which should help some. Currently using hdmi to vga adapter. I can easily watch youtube videos at 360p without to much of a problem. But once i bump it up to 720p it starts to lag out. b1ackdeath wrote: For the desktop i'm using ldxe. Even with the drivers installed there is still some expected window lag right? Like it takes a few seconds for the window to re-draw? 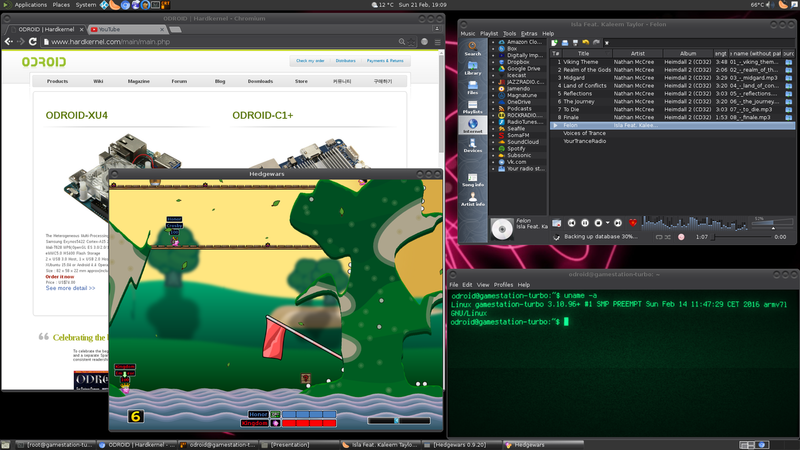 Yes, there is no 2D acceleration (desktop) for ODROIDs at the moment, which makes Windows movement laggy. "A few seconds" is a little bit long, the window should pick up in less than a second, but noticeable slow. If you ONLY use it for Desktop applications (no fullscreen applications such as Kodi) you can actually use some Desktop compositors like xcompmgr to speed up the desktop to full speed without lags. b1ackdeath wrote: Currently using hdmi to vga adapter. I can easily watch youtube videos at 360p without to much of a problem. But once i bump it up to 720p it starts to lag out. What browser are you using for youtube? Desktop has no video acceleration so youtube videos are rendered in software mode. If you use something like FireFox/IceWeasel then you slow your system down even more since it misses any type of hardware acceleration. Using Chromium allows for some form of hardware acceleration. The Webpages are rendered in OpenGL ES/EGL (with the correct starting parameters for Chromium). Which speeds up browsing. 720p should work with Chromium just fine. You can even install pepperflash for Chromium which allows for flash support in Chromium. Not sure about the U2/U3 (haven't tested it in a while) but on the XU3/XU4 with flash you can get 1080p running in Chromium. So I'd say at least 720p should work without issues using pepperflash. I have problem logging in using serial connection. If I try to use root user it doesn't ask for password. I'm using PuTTY. I haven't tried loggin in via UART in a very long time, could be that it's not working. I normally only use SSH or direct access. Currently I'm a little too busy to look into it, so I can not give you an ETA when I'll have time to look into this issue. What other method there is to login using root? I don't get picture through hdmi.